“A tree laden with fruits always bends low”, said Ramakrishna and his words were truly proved by Mr Rajiv Singh, the CEO of Karvy Stock Broking Ltd.
Vito Altor Ambition gave me a chance to grab an opportunity to interact with Mr. Rajiv Singh, CEO of Karvy Stock Broking Ltd. But great things don’t come so easily. Some of my friends working for Karvy would speak highly of him whenever we discussed our professional lives and this instigated me to know more about him. I tried reaching him through the formal channel but the HR Manager was unable to facilitate the meeting because Mr. Rajiv was caught up with his other professional commitments. After a lot of tedious networking, I was able to contact the Financial Advisor of Karvy, Miss. Swagatika Sahoo, on whose request Mr. Rajiv agreed to interact with me over a call. Mr. Rajiv is a certified CMA from ICWAI with more than 18 years of experience in costing, planning, raising support, back and tasks, business extension and item improvement. He graduated from The University of Allahabad in Mathematics, Statistics and Economics. I had a good 50 minutes of interaction with Mr. Rajiv on 13th of January. Our interaction started with him enquiring about my professional background. On being asked about the critical decisions taken by him, Mr. Rajiv replied that in an era of technological disruptions, the most important decisions he has to take on a day to day basis is how to outperform competition and lead the market. Apart from that, he decides on matters like the positioning of the company, the methods to differentiate themselves from the competitors, proper leverage of technology, forging right partnerships, selecting right PR agencies. They also make strategies about hiring, developing and retaining the best talents and how to keep them motivated. Mr. Rajiv’s journey throughout has been a really challenging one. One of the biggest challenges he faced was the changing needs and demands of people and adapting accordingly. People today want everything at lightning fast speed and the only way to do that was to go online. He faced challenges while convincing his colleagues for the idea of going online, but his constant persuasion and lucid articulation of his vision made the implementation a success and Karvy now creates and processes Demat accounts at a much cheaper cost, using much lesser workforce and at a very high speed. Moving over to the people strategy, Karvy makes use of internal competitions to keep people motivated and to generate new ideas. They believe in tailoring their motivation strategies owing to the diverse nature of its workforce. Mr. Rajiv also mentioned interviews as a very brutal means to judge a candidate’s skills and knowledge. So, he measures the capability of a person to learn and openness to change as a metric to differentiate individuals. Change has always been constant, different is the pace at which changes are taking today. The discussion further moved towards his personal life where he mentioned about one incident that shaped his future. Switching over to Commerce from Science for Graduation, was a tough decision for Mr. Rajiv. One fine day one of his Professors, Mr. Basu asked him a question which he couldn’t answer and so throwing the duster at him, Mr. Basu said “Arey tu kab seekhega re, boka bihari”. This incident ignited the spark of motivation in him and he not only cleared that subject with distinction making his teacher proud, but also excelled in all other academic activities. His career hasn’t been a smooth sail and experience for him. Mr. Rajiv has his own sets of lows that were during the financial crisis of 2008, where there were job cuts, and budget cuts etc. However, this did not deter him from being optimistic about the future. His capability of foreseeing the future and strong belief in it, is what kept him going. Likewise this predicament lasted only until 2012 and thereafter there was no looking back for him. What is life without risks? – One of the greatest risks Mr. Rajiv took up was switching from being a UPSC aspirant to Finance, when 50% reservations were included in the UPSC examination. Professionally the greatest risk for Mr. Rajiv was switching from the comfort zone of support activities to highly agile marketing division where every day new targets need to be met. Another risk he mentioned was setting up the Advisory desk which was a huge investment and could have led to huge sunk costs. But with great risks come great returns, and this immensely increased the productivity of Karvy. 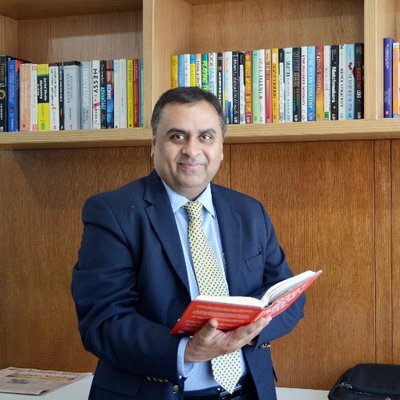 Mr. Rajiv is a passionate reader and he measures his days with his newly acquired learnings. He believes that reading gives a person new insight and keeps him updated. His latest readings include ‘Principles’ by Ray Dalio, and ‘Thank You for being late’ by Thomas L. Friedman. Mr. Rajiv also quoted that one of the key qualities of a leader is the ability to take up the ownership of his work. People who are ready to take ownership of their work will make decisions more responsibly, carefully and thoughtfully. It is important to catch the cues from internal and external environment to increase your preparedness to change and constantly evolve. Use your resources judiciously for you never know how things will take a turn. The key to gaining acceptance to novel ideas is to be able to clearly articulate the pros and cons of implementing the idea. Thank You Sovit for the appreciation! Very well conversed and written. Great job. Thank You Abhishek for the appreciation! Thank You Deeksha for the appreciation! Thank You Jaskirat for the appreciation! Great insights!! Indeed a good read.! Thank You Khushbu for the appreciation! Thank You Vivek for the appreciation! Thank You Darshana for the appreciation! Dwelled deep and nicely articulated. All the best! Thank You Harini for the appreciation! Thank You Anil for the appreciation! Thank You Mansi for the appreciation! Thank You Bhawana for the appreciation! Thank You Siddhant for the appreciation! Thank You Divash for the appreciation and the support as well! Very nicely crafted and expressed! Amazing work! You have penned down your conversation really well! Insightful. A must read for everyone. Inspiring and very beautifully written indeed! Thanks for sharing. And I’m sure, one day someone will definitely write the story of Ms. Firdaus also. The write-up is well written which shows his extroversion nature of that person. Fabulous job Firdaus. It was really enriching and I gained valuable insights from your write-up. It also portrays your tremendous hardwork and genuine dedication towards this project. Keep it up and all the very best for your future endeavors. Very well articulated, worth a read. Very well written, Firdaus. All the best! Well conversed and nicely captured. Aptly written, commendable content. Expecting few more like this in future. Keep going lady. May I know what is Vito Alter Ambition and how they helped you to meet him ? Such an insightful article. You have penned it down very well. Really helpful article. All the best ! !